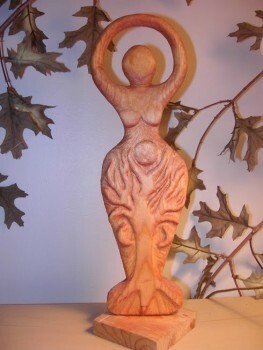 MaAnna Stephenson is a self-taught carver residing in Nashville, TN. 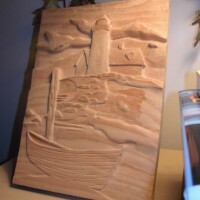 She began sculpting wood relief pieces as a hobby in 2002, creating one or two pieces a year. One of the first designs was a small green man followed by larger seascape scene. Both were carved with only a simple carving knife. In 2003 she acquired her first set of Japanese micro-carving tools, which were small hand held gouges and blades. With these new tools she tried her hand at 3D sculpture by creating a unique Gaia figure. Later in the year she returned to relief carving and took up her favorite subject, which was the architectural shape of bare trees. By 2004, MaAnna became interested in the intricate designs of scrollsaw work. Soon afterward a friend asked for one of her carvings. 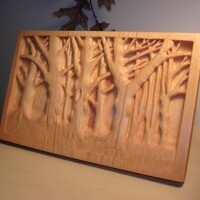 Wanting to make the piece unique, she was inspired to combine her tree relief carving with scroll cut pieces. She created the design, which is the signature tree also found in the Heartwood Art logo. After making a prototype in plywood, MaAnna was ready to carve the final piece. However, the local shop which supplied wood for scrolling told her that the design would explode when a solid piece of 1/4 inch wood was used as the blank because wood comes from round trees and when all the waste wood was cut out, the piece would attempt to bow back into its original shape and explode. After a long search, MaAnna found the shop of Del’s Woodcraft, Inc where old-style craftsman Del Craft makes thin solid wood sheets for scrolling. MaAnna told Del what she wanted to do and he hand picked the proper stock and grain for the project. MaAnna slightly redesigned the piece to architecturally hold the wood. The result was stunning. 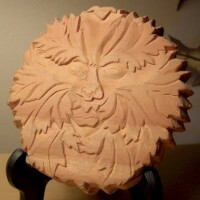 MaAnna was able to use specific carving techniques to give the piece three layers of dimension and depth. The moon hangs behind the tree and features the face of her friend cut into relief. The piece was presented as a birthday gift in 2005. 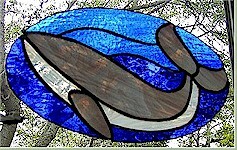 In 2006, MaAnna took a stained glass class and decided to incorporate it into her wood designs. The response to these unique pieces prompted her to open Heartwood Art in 2007 and she began selling them as a limited edition series, with only a few pieces created each year. Her first pieces make use of solid sheets of multi-colored stained glass, but full stained glass landscapes will also be incorporated into future designs. MaAnna (pronounced May Anna, like JoAnna) is degreed in electronic engineering and formally educated in music and acoustics. She is a multi-instrumentalist and published composer with international airplay. In 2008 she became a published author of non-fiction including The Sage Age – Blending Science with Intuitive Wisdom. She is the owner of BlogAid where she trains and consults on WordPress for Non-Geeks, including SEO, conversion, site security, performance, and more.